Political language, said George Orwell, is designed to make lies sound truthful, murder respectable, and to give an appearance of solidity to pure wind. Dr. Sarath Amunugama is the subject of this essay. In addition to his current incarnation of a politician, he is an erudite scholar, a socio anthropologist of repute. His incisive mind’ has few rivals in the parliament that stands dissolved. I last met him on 30 November 2015 when he joined Professor Gananatha Obeysekera in celebrating the life and work of Dr. Stanley Thambiah in a panel discussion at the International Centre for Ethnic Studies. Dr. Amunugama bid farewell to his departed colleague by reciting four Buddhist stanzas, beginning with “Anicca vata sankhara” – Impermanent alas are formations, subject to rise and fall. The learned trapeze act, at the time, impressed me no end. I rushed to print in admiration. I described it as the distilled decency of the Sinhala Kandyan Buddhist ethos. The essential purpose of this essay is to eat my words. Sanskrit, the language of Kama Sutra, has 247 equivalents for the word love. Dr. Sarath Amunugama is far more modest than ‘Vatsyayana,’ the author of the love tract. He seems to have less than 200 equivalents for truth. A little more than 100 equivalents for intellectual integrity and around 50 for politics of expediency. He has a sensitive and delicate grip on the pristine essence of the Gita – how to evade mental and emotional traps, how to create an outer life that feeds your inner life. He has amply demonstrated his versatility in interpreting events to suit his idea of truth, alternate truth and manufactured truth. It is such a pleasure to write on the politics of a scholar who can recite forwards and backwards the famous tract ‘Politics as a Vocation’ by Max Weber, the German pioneer of social anthropology. On the morning of 4 November Dr. Sarath Amunugama called on the Malwatte and Asgririya prelates. He assured them that the international community had not exerted any pressure on the country. He told them that “the European Union had only requested the Government to resolve the current problem in the country democratically. 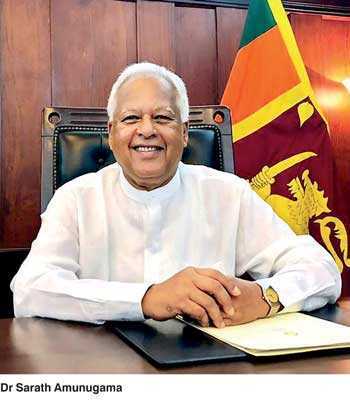 On 5 November Dr. Sarath Amunugama told Jack Moor of the ‘The National’- the Abu Dhabi based English language newspaper – that the current “crisis was a case of who reached for the gun first”. This is how the largest circulating English paper in the Middle East reported it: Sarath Amunugama said the ousting would be finalised with a Parliamentary vote in the new Government’s favour and that the takeover was just a matter of “who reached for the gun first”. On Saturday 10 November Dr. Sarath Amunugama tells the Associated Press Correspondent that the President was compelled to dissolve Parliament because the Speaker “was not planning to act according to the Constitution and Standing Orders of Parliament” and that “there was to be a lot of commotion and un-parliamentary activities sponsored by the Speaker”. The report appears in the Washington Post of 10 November. Sarath Amunugama has presented three contrary versions – two to the world and one to the two prelates in Kandy. And he is not ashamed of those untruths. The words of that monster have a sure resonance when we hear the learned Trinity educated Dr. Gobbles of Gunnepana Kandy.Sarath Amunugama has read Emanuel Kant. If I was writing to Wimal Weerawansa, or Sirisena the President, I would not have bothered with Emanuel Kant and his teachings on morality. The philosopher once remarked that “no man in his true senses … is candid.” When he said it, he did not outright dismiss the value of either truthfulness or sincerity in human transactions. What he meant was that we must restrain our inner thoughts that basically express contempt for our fellow beings. That is precisely what Dr. Amunugama has been trying to do with his three statements cited in this missive. Emmanuel Kant recognised contempt as a dangerous thing. The danger of contempt is that it helps to dehumanise your target. That is the precise travesty Dr. Amunugama commits with Speaker Karu Jayasuriya. He has unscrupulously made Speaker Karu Jayasuriya, an intrinsically gentle creature and a character, into a monster that he could never be. Partisan politics has a disregard for truth and virtual commitment to convenient untruths. But Sarath Amunugama must not entertain the illusion that gross falsehoods can add up to a constructed truth or even a half-truth.